Google is focusing on battery life in Android O by clamping down on what apps can do in the background. 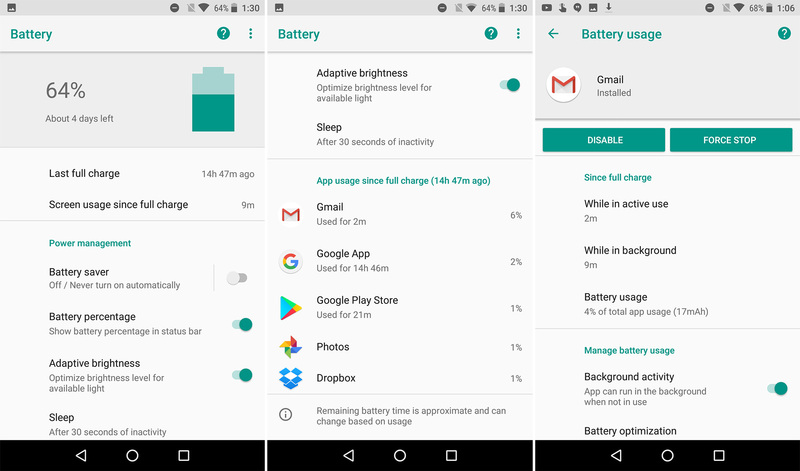 At the same time, Android O includes a new battery settings menu that attempts to present your usage in a more understandable way. Instead of simply showing how much juice an app used, it puts battery use in the context of how you use the phone. When you see an app at the top of your Nougat battery stats, it's not always clear if that's because you used it a lot (so you'd expect it to be high) or the app is just doing something it shouldn't be doing. In Android O, the main list of battery users indicates the amount of drain as a percent and the amount of time you actually used it. You can drill down even further by tapping on one of the apps in your list. This battery usage screen tells you how much of its battery usage happened in the background and how much while you were actively using the app. So, something like Pokemon GO would be at the top of your battery usage list, but this menu makes it clear most of that usage occurred while you were actively playing the game. Plus, you can see how long it was used. It really helps put battery drain in context. At the top of the usage stats for individual apps are buttons to force stop and disable/uninstall. At the bottom are helpful links for battery optimization and background activity settings. This all applies to mostly stock phones. Samsung, LG, and the others will probably swap in their own battery stats.